Can you believe the Eighth Annual Home For The Holidays Pet Adoption is right around the corner!? Me neither! The 8th annual Home for the Holidays pet adoption fair will feature more than 500 animals for adoption from 40+ animal shelters and rescue organizations. All animals are spayed/neutered, vaccinated and microchipped. There will also be vendors, low-cost microchips, a silent auction, food trucks and an opportunity drawing. Parking is free and admission is just $1. 800+ adoptable dogs, cats, rabbits, and more! This event seems to get bigger every year and has spilled into the parking lot at the Irvine Animal Care Center. While there aren’t a ton of pet products at this event their are quite a few animals up for adoption including dogs, cats, rabbits, and even pigs! There’s a silent auction (we’ve won bids a few times at the silent auctions) and food trucks just in case you want to grab lunch to complete your day. So come on by and support your favorite shelters and rescues and of course stop by and visit us at the Guide Dogs of America (GDA) booth. America’s Family Pet Expo: Usually occurs mid April. This years Pet Expo will be held April 10-12th 2015. We’ll have more information early next year. Super Pet Adoption – I think this one is usually scheduled for the beginning of June. I don’t think next years Super Pet Adoption has been scheduled yet. 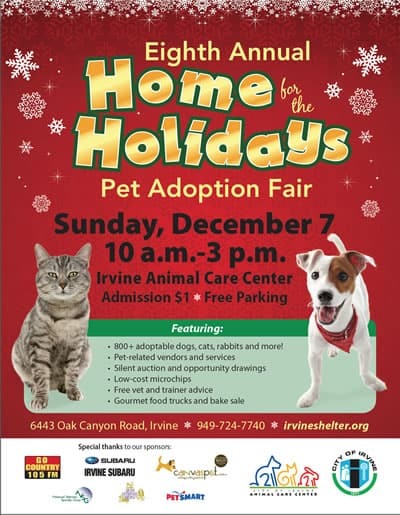 Home For The Holidays Pet Adoption – This is the one we will be at in less than 2 weeks! What do you guys think of a calendar? We go to several events every year and love to support our local shelters, rescues, and other non-profits. In the name of ORGANIZATION I think I’ll put together a calendar for next year. After all I do the same thing for all of our OCGDA outings! Maybe you can visit us at some of our booths or outings in 2015.
Who else is “in” for the Home for the Holidays Pet Adoption? If you we don’t see you at this years Home for the Holidays Pet Adoption then have a wonderful holiday season!